This series celebrates the precarious and the catawampus. As I work on these characters, I don’t have preconceived faces in my mind. I know I want them benevolent and lively. I avoid visual distractions and instead listen to stories, letting what I’m hearing influence my manipulations of the clay. 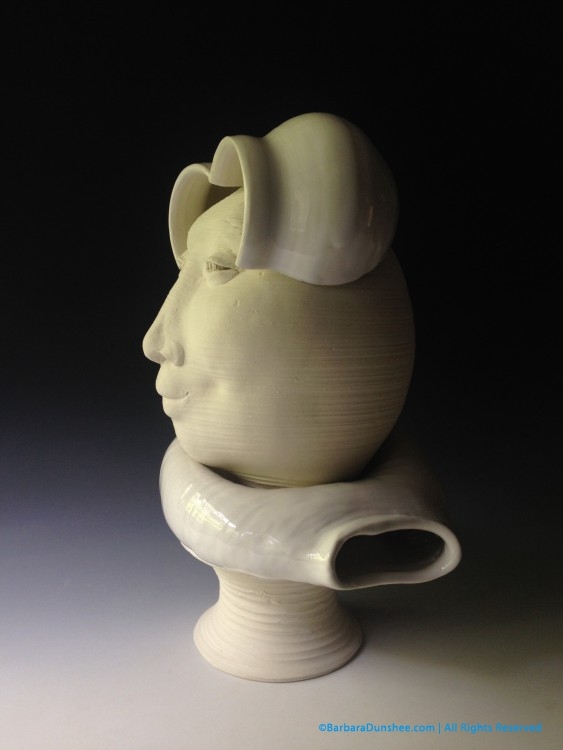 There is usually a moment when the piece shows life, inhales, and a personality, complete with a back story, emerges. The trick is to refrain from steamrolling over that, losing what I’ve found. Structurally, the sculptures are the bringing together of various normal vessels and their altered parts. I throw orbital shapes using the pottery wheel. My fingers and tools trace visible ridges in the wet clay as the machine spins, showing the distinct horizontal orientation of pieces typically made on a wheel. I’m careful to not erase these ridges as I sculpt, letting them run right through the features of the faces. In the spirit of rock cairns, I’ve been balancing vessels on top of another at various angles, letting the divergent throwing lines naturally play up their off-kilter relationships. Sometimes I mash one pliable vessel onto another, or bisect, rearrange and join the halves to another vessel. 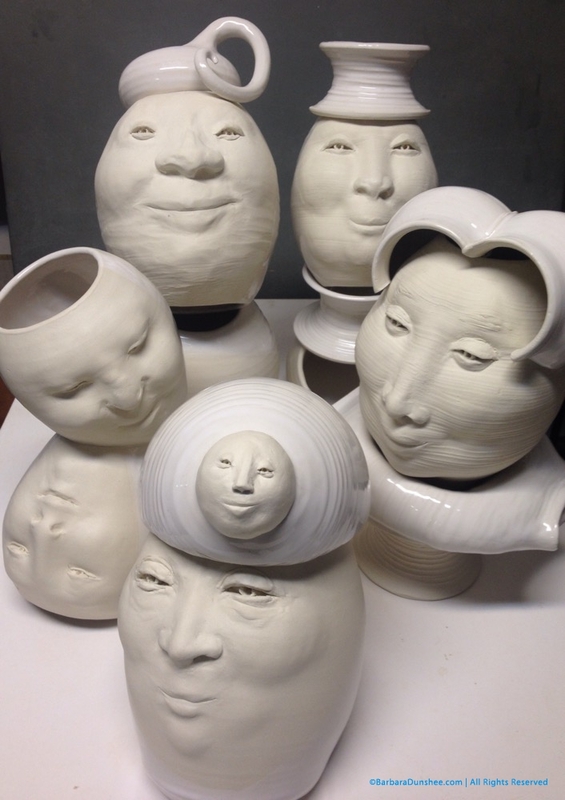 All these actions, the stretching and sculpting of the faces, the mashing, the cutting, the joining are done while the clay is still moist, giving me small windows of time to make choices. Exposed to air, the forms can set beyond workable, so everything lives under plastic when I’m not actively altering them. Though the pieces are truly balanced through gravity, I re-enforce the structures so they don’t diss-assemble themselves with a bump or a shake. Want to meet them? They are currently on exhibit at HomeStreet Bank in Madison Park. 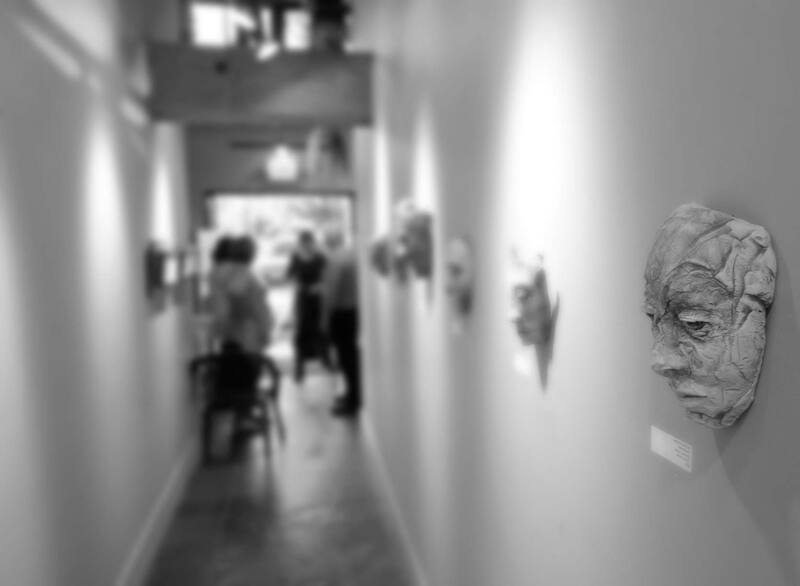 It’s a lovely space and art lovers are welcome to stop in!